Attention costumers, historians, SCA members, and those interested in making laces seen in early portraits, garments and furnishings in museums! The narrow laces in this new book have been worked in linen, cotton or wool and are taken from original sources - portraits and the few surviving laces of this period. Gil Dye has photographed them and then done reconstructions, each with a working diagram and a photo and pattern draft at actual size. 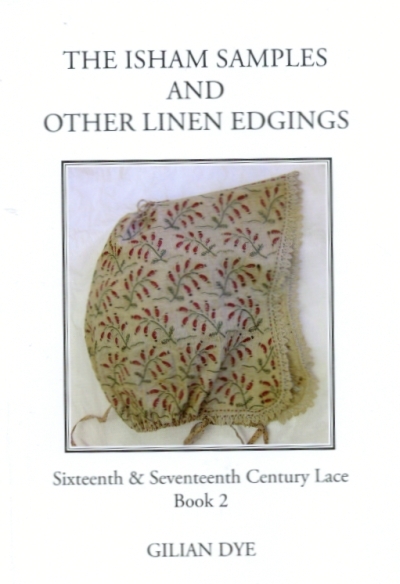 The author postulates that 16th & 17th C. lace makers worked most narrow laces without a pricking or instructions, and gives helpful suggestions for you to do likewise. Today, we call this free hand lace. She describes the lock stitch that helps to control tension and minimizes the need for pins - a very good solution to problems of copying very old laces using a variety of thread sizes - without prickings. Very few pins would have been used. The title mentions Isham samples. These were five narrow lace samples attached to a letter written by Elizabeth Isham about 1627 to her father. This Elizabeth was born in 1608 or 1609, five-to-six years after the death of Queen Elizabeth I. There is a nice little biography of Elizabeth, and a photograph of the Isham jacket that is in the V & A collection. It reminds of the circa 1610-20 Margaret Laton jacket, though clearly not as lavish. There is a pattern and instructions for the black and white lace edging on the Isham jacket. Gil Dye has been writing useful books and lessons for lace makers since at least 1979. There are 12 titles in my library, and that would not be all of them. She is also a generous contributor to various lace guild bulletins. The current review is of the second in a series. The author is now working samples for Book 3.